The Message journal is a peer-reviewed academic journal that consists of blind reviewed academic papers and occasional commissioned essays. It is dedicated to the development and discussion of contemporary and historical visual communication research, particularly with an emphasis on Graphic Communication Design practice, outputs and artefacts. The aim of the Message journal is to explore and challenge the boundaries of visual communication within art and design through an experimental and developmental ethos, challenging the practitioner, the development and use of technology, as well as questioning visual communication values such as social, ethical and sustainable practices. The journal was established by founding members of the Message research group at the University of Plymouth. We are now also very happy to announce, the co-editorship of the journal has been expanded to include colleagues Åse Huus and Dóra Ísleifsdóttir, from the University of Bergen. Message 4: What are the politics of your design and what is the design of your politics? engage with and change the broader social, economic, and political circumstances? address cultural colonisation, systemisation and appropriation? counter misdirection and falsehoods through illuminating meaning, knowledge and facts? This edition brings to the fore academic research on the following question; where if any do the mutual theoretical frameworks and methodologies lie within communication design, graphic design, illustration and visual communication? In this inaugural edition, the refereed submissions discuss a range of practices and approaches that include the use of socially responsible design and persuasion, as well as collaboration with other disciplines, to improve safety; framing theory and ideograms within architectural pedagogy to convey complex ideas and relationships; literary analysis to explore graphic design authorship, narrative and viewer experience; discursive dialogue and a non-linear presentation to interrogate and shed light on personal practice; and cartographic metaphors as a means of visualising and investigating the topography of graphic design. The journal is available to purchase through University of Plymouth's online store. Typography, Lettering and Text as Image. In this second edition the refereed submissions discuss a range of approaches that create type designs to reinterpret letterforms. Linguistic function is challenged by a process where text loses its narrative role and becomes a texture of information; onscreen typography within the context of film and video; digital interface designed to ‘write images’ in a screen-based environment; artists’ books and the alphabet; avant-garde European philosophy and experimental typography; a revisit of Walter Benjamin’s essay, The Work of Art in the Age of Mechanical Reproduction (1936), within the context of contemporary Letterpress typography and finally, the examination of the textured intersection of typography, fashion and body in kinetic text. Benjamin, Googlization, and the Withered Typographic Auratic – Richard Miles, Leeds College of Art. The Background Speaks: David Mabb’s Announcer and the Emergence of Information – Emily Rosamond, Goldsmiths London, University of Kent. The Visible and the Legible: Text in Avant-Garde Film and Video – Holly Willis, University of Southern California. Letters are Media, Words are Collage: Writing Images through A (Dis)Connected Twenty-Six – Jessica Barness, Kent State University. Kinetic text: The Textured Intersection of Typography, Fashion and Body – Steven McCarthy, University of Minnesota and Anna Carlson. Available to purchase through the estore. What is the topography of the contemporary graphic design / communication landscape in relation to art practice? What occupies the space between disciplines? 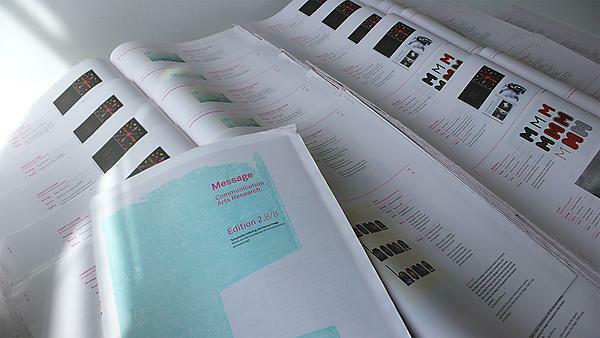 In Message journal edition 3 the refereed submissions explore further the boundaries between contemporary graphic design/communication and art, as well as examining what is occupied within the space between the disciplines. Authors, through written and illustrated submissions, question and investigate the broad nature of graphic design and communication practice and its relationship to art, in relation to both historical and contemporary contexts. The edition debates and illustrates how graphic design/communication can be seen as imaginative, intuitive and creative self (or group) expression – a form of artistic composition – in the same way that we recognise much of art practice. The edition examines practice outside of the conventional boundaries of contemporary graphic design/communication and considers how this space is occupied.